I only have mince left, and I've already made rissoles this week - HELP! We have all been in this scenario - We open the freezer looking for something to hit us for inspiration, and the only thing staring back at us is mince. Usually by this stage rissoles has already made an appearance to the family for the week, or it has at least appeared very recently. Now here's another option: Pasties. Now straight away you might be thinking of the ones filled with veggies like your Mum used to make. These ones however are veggie free, and has been adapted over the years from my Mum's recipe. Preheat the oven to 180 C. Start defrosting your pastry on the bench while you start putting together your mince mixture. In a bowl add in the mince, onion, herbs and chutney, and mix to combine. 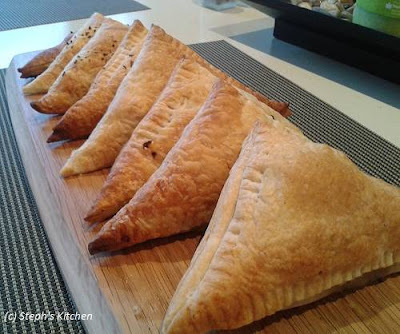 To make smaller pasties, cut your pastry diagonally to create four small triangles. Place a heaped dessert spoon of mince on one side of each triangle, shaping it slightly into a small triangle. Using a pastry brush (or if you don't have one, just use your finger) run a little bit of water along the edges of the pastry triangle. Fold the pastry to cover the mince, and using a fork press the edges down until it is closed completely. If there is a little too much meat, and the pastry seems to be pulling to much to close, simply take out a little bit of the meat and try again. Continue for the rest of the pastry, and place on a baking tray / dish sprayed with cooking oil. Before placing them in the oven brush the tops of the pastry with water. Bake for 20-25 mins or until golden brown. Serve with gravy or your choice of sauce. Enjoy! Note: If you would like larger ones, simply cut the pastry diagonally the once to make two large triangles. My Mum used to make the larger ones for my Dad and herself, and smaller ones for the kids so that everyone could have one each. These are also great for lunches, so I would recommend making a little bit extra if you can for the next day. Mum used to even pack them for us kids, cutting a little into the pastry so that she could squeeze in a little bit of sauce inside without it going all through the cling-wrap in our lunch boxes.